When time is money--lots and lots of it--a quarter-million-dollar SUV conversion from Becker Automotive Design can be worth every penny. (Business 2.0 Magazine) - Some executives soar with eagles. 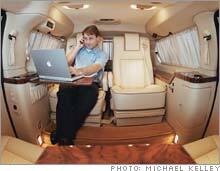 They're the power brokers who fly in peerless comfort, efficiency, and style on wings made by Gulfstream or Learjet. Yet there's another breed of titans who keep their feet firmly planted on terra firma. These moguls are rich, yes, and their time is also very valuable, but in the course of doing business, they're more likely to shuttle between, say, Long Beach and Burbank than to jet from LAX to JFK. Whether they're real estate developers or fast-food kingpins cruising from one Pizza Hut franchise to the next, they need to be productive on the road."